Looking for a luxurious, fully furnished, beautifully decorated home away from home to host your family? Then look no further! The Estate at Wildflower is available for as few as 3 nights, or by the week, depending on your needs. Perfect for high level executives with families needing a corporate stay. Located just 30 minutes from downtown where you can take advantage of a conference at the Convention Center, a Card's game at Busch Stadium, a night out at Lumiere Casino or the many other events downtown St. Louis has to offer. The Estate at Wildflower also has many fun activities for the family right outside it's back door! Starting with Paradise Valley Golf Course an 18-hole course open to the public within walking distance. Kraus Farm Equestrian Center or Valley Mount Ranch are 5 minutes away and offer horseback riding for the entire family. Six Flags is a short 10 minute drive on I-44 and offers an amusement and water park. If all this activity sounds like too much, then just spend your time at 'The Estate'! The park like grounds offer a very private, wooded, serene setting yet you are still 5 minutes away from the nearest Starbucks! The Estate at Wildflower is a custom built, 5000 sq. 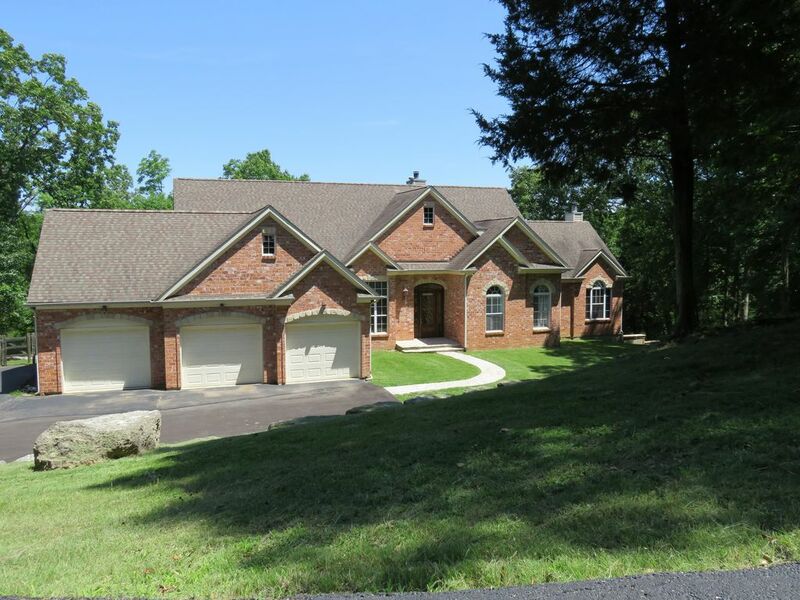 ft. home built on a 7+/- acre, totally secluded lot. Enjoy the parklike setting and watch the deer and turkey that stroll through the yard, or spend the evening in the 7-person Caldera Hot Tub/ Spa. 'The Estate' is fully equipped and nicely appointed to meet you and your guest's needs. The gourmet kitchen boasts Brazilian granite counter tops, stainless steel appliances, Jenn-Air cook top, and double oven. We have provided a wide array of dishes, pots, pans, utensils etc. to meet your entertainment and food prep needs. Two dining tables, one seats 8, the other 4, for seating your guests. There's a huge deck off the back of the house, just off the kitchen, overlooking the golf course for your summer BBQ's on the gas grill. 'The Estate' has 5 bedrooms, 4 king-size beds, and 1 queen-size bed. There's also a queen-size sofa sleeper and a king trundle bed. We can sleep 14 in beds with an occupancy limit of 16 (strictly enforced.) The home has 4 bath rooms including the master en suite with an oversized tub (whirlpool feature disabled for safety reasons), his/her sinks, and 2-person shower. There are 2 decorative fireplaces, and 1 wood burning fireplace (Duraflame logs only.) Three large screen TV's and 1 smaller flat screen TV with DirecTV will satisfy your TV viewing needs. A game table with roulette wheel, chess set, and plenty of decks of cards will meet your gaming needs. Relax and enjoy reading a book from our library in front of a roaring fire or in the screened-in porch listening to the birds. We have spared no expense furnishing your home away from home. Many of the art pieces and sculptures are original pieces of art. We have provided a weight bench, weight set, and gym-quality treadmill to meet your exercise needs. If you plan on working from 'The Estate' or just need the internet to find a nearby restaurant or grocery store, you will appreciate the free broadband (60 MB Charter pipeline) wireless internet that can be enjoyed from most any nook and cranny in or outside the home. Stay once, and you will want to stay again, as many of our guests have. We look forward to entertaining you! I am a licensed real estate broker in St. Louis, MO. When I briefly relocated out of state I couldn't bear to part with my dream home and converted it to a luxury vacation rental. This is a serene location. I love to stay here when I need to get away from the city but need to stay close. Every piece of artwork and furniture were carefully hand selected. Luxury can be affordable. Imagine saving the cost of 7 hotel rooms and everyone being able to stay under the same roof and socialize. The ability to prepare your own meals in a gourmet kitchen, dine together, relax together in a beautiful setting in harmony with nature. toilet, Half bath with sink located off the gaming area. Only one garage spot provided for guests. There is also a breakfast room adjacent to the kitchen that seats 4 and a dining set on the screen patio that seats 6. Great place for a few families to share to enjoy what St.Louis has to offer. This home worked perfectly for our 3 families that came to watch our 2 oldest sons in a college golf tournament over the weekend. Lots of room to watch March Madness basketball when not at golf. We were able to make wonderful breakfasts each morning with everything the kitchen had to offer. Competitive chess games were had, as well as bench press contests and a relaxing soak in the hot tub before bed. We definitely will be back if we are in the area again. Had a family reunion (n=18) at this great home (we actually held it here in 2011; it was lovely then and even better now). Lovely decor. Plenty of space for everyone, and plenty of space for large and small gatherings throughout the house. The house was spotless and all amenities present as promised (well, except washer wasn't working but that wasn't an inconvenience..the dryer did work so we could dry towels). Fine internet, good number of TVs, great hot tub. So happy to walk in and find a huge, beautifully decorated Christmas tree (we celebrate Xmas at our annual reunion). The beds/bedrooms were perfect, sufficient bathrooms (and towels!) and great parking. Very close (<10-15 minutes) to stores and movie theatres and Starbucks Easy to get to, and a beautiful setting once we got there. We have an annual Maus Chopped contest and the kitchen was perfectly appointed for such an affair. Management texted regularly to ensure we had everything we needed. I highly recommend this listing!! I am sure we will be back. JMF, M.D. The house was out in the boonies, but the setting was beautiful and the house was spacious and -- most important of all -- CLEAN! We had 14 family members, including little ones, and there was plenty of room for all of us. The deer were amazing! So beautiful to watch. I would rent again. Plenty of Space for 12! Quiet location with quick access to a variety of golf courses. Would highly recommend.